Join us for an inclusive, open, and beautiful fundraising evening for the Regina Sexual Assault Centre. Shoulderbirds Productions is very honoured to be presenting I Dream Before I Take the Stand by Arlene Hutton. This event is on for two nights only! 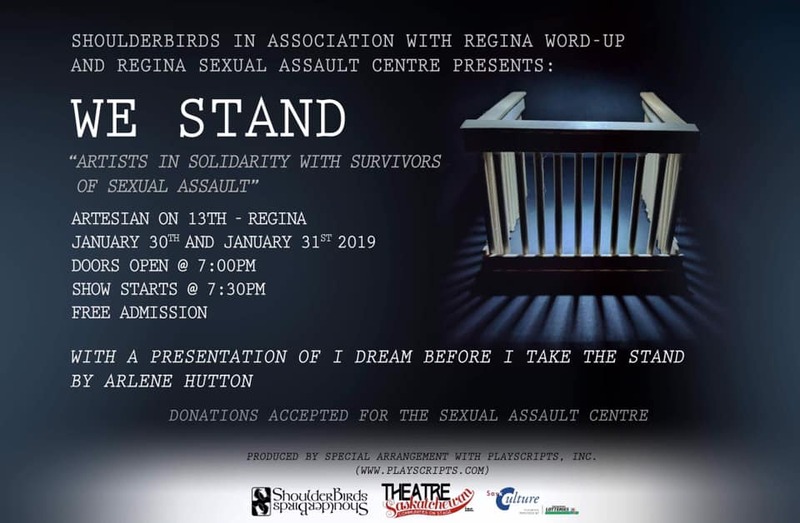 Do not miss your chance to listen to poignant poetry and personal stories presented by Regina Word Up and see I Dream Before I Take the Stand. Join us after intermission for a Q & A with the Regina Sexual Assault Centre where you may anonymously ask any questions you may have, and hear important insight on self-care and healing. This event is FREE to attend, but we suggest you bring a cash donation for the Regina Sexual Assault Centre. Arrive early to guarantee you get a seat.